Almost exactly two years ago, Image Comics teased Ivan Brandon and Esad Ribic’s “space gladiators” series Vs, whetting the appetites of sci-fi fans looking for some Heinleinian exploration of military evolution to offset the wave of post-apocalyptic and cyberpunk works that had taken over the genre. That wave is still rising, if anything it’s grown larger, so Vs still feels as novel in its setting as it did when it was first revealed, but in this debut issue it’s difficult to discern whether the commentary on war-for-profit will be as fresh considering our real world is closer to using military forces for ratings than it was in the early days of 2016. Vs is striking, intense and chaotic, all great qualities for entertainment, but will it ultimately be aware enough to not betray its own messages? This dilemma is largely the result of Ribic’s entrancing illustrations and how well they fill out a world we’re only given the thinnest of details on. Though Ribic’s style is “realistic” in the same sense as Alex Ross’s, there’s an otherworldly heaviness to his aesthetic that sets him apart from the hollow, unfeeling approaches of so many post-Ross painterly comics artists. That’s incredibly valuable in a work like Vs, where the setting needs to be alien yet also evocative of what we suspect our own future may look like. Vs is set in a place and a time where augmented superwarriors battle for the viewers’ entertainment, their actions regulated like a sports event, complete with referees, team names and breaks for sponsors. 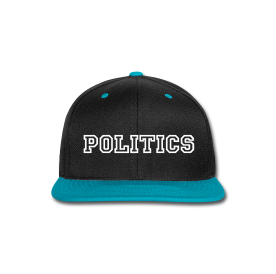 But the casualties and stakes are real and Ribic deftly balances that otherness and familiarity. Where Ribic, and by extension the comic, struggle is in the presentation of this action. Vs’s protagonist is the veteran team captain Lt. Flynn, a blue skinned gladiator who happens to look more or less identical to most of his teammates. Flynn can be recognized by his orange bubble helmet and six extra metal arms, whereas his teammates are different because one is also bald and blue skinned and has a bubble helmet but flies on a jetpack and another is bald and blue skinned but has no bubble helmet and only two extra metal arms. There’s probably a point to be made about how this homogeny in the character designs reflects the disposability of these tv soldiers but that’s not really backed up by the text, certainly not to the extent that it is in a similarly minded work like X-Statix. You can engage in a similar bit of devil’s advocacy regarding the action choreography in Vs. 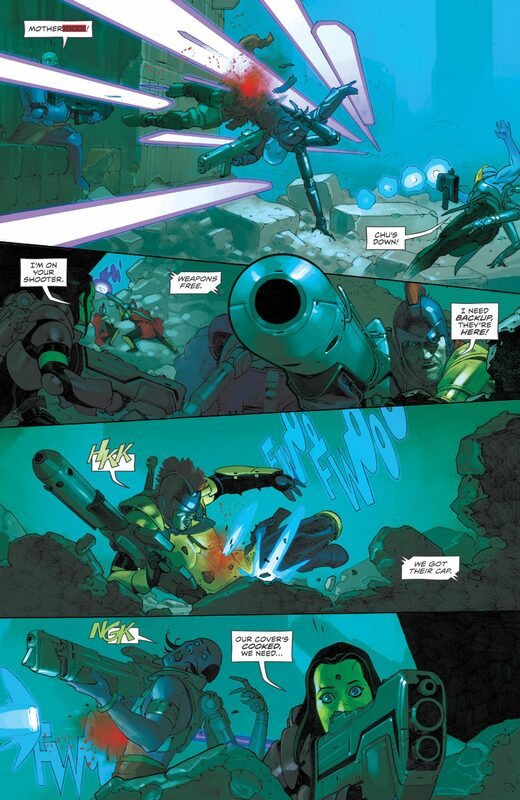 The issue opens with a stylistic and thematic fake out, establishing the setting of the story via a sequence of pages and panels highlighting the empty silence of the space surrounding the battle world our gladiators are fighting on. Initially there’s a nice rhythm to the unfolding action, zooming in closer and closer to where the conflict will take place, as both sides attempt to draw the other out. But once the fighting starts in full, the action is muddled and chaotic, with some jarring moments that disrupt the flow by breaking the 180 degree rule for no discernible reason. Interestingly enough, the Vs that was previewed in 2016 featured coloring by Ive Svorcina was brighter and flatter, making the action easier to follow because the characters didn’t disappear into the background as much. 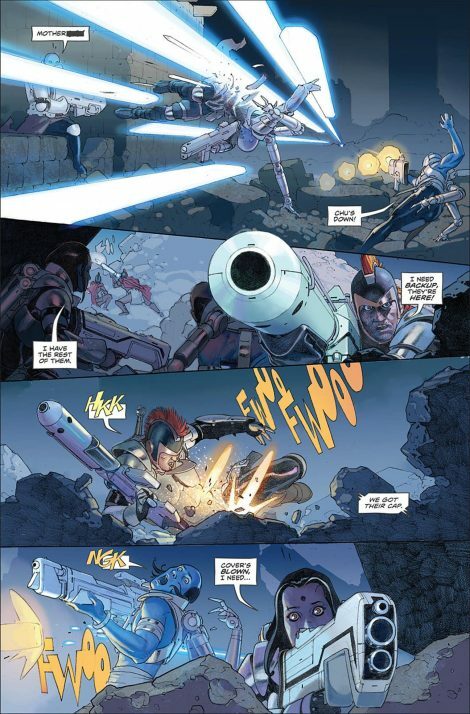 Svorcina’s approach was closer to the Metal Hurlant comics that likely inspired Vs than the almost Zack Snyder-esque palette Nic Klein brings, where everything from the people to the environment to the sky is green and blue, with occasional flashes of purple and blood red. 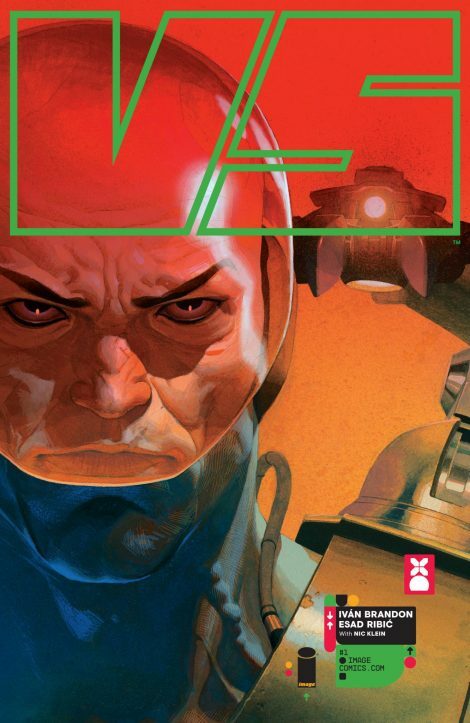 Klein certainly makes Ribic’s work shinier but this story needs visual clarity, not sheen. This is what the original coloring for that page looked like. It would also be easier to believe the confusion of the action is strictly for thematic reasons if the non-battle parts of Vs were more visually coherent. In between the battle segments, the story shows Flynn in the “real world,” recovering from a devastating injury, eager to get back to fighting. We’re told that Flynn has been in the hospital for nearly three months and the argument he has with his doctor about the length of his stay seems to take place in perhaps a single day (with yet more of those commercial breaks to signal this is all being broadcast), yet their argument ends with an awkwardly placed panel showing a crowd outside the hospital, now indicating he is going to be immediately released. The exact details of the timeline don’t really matter, except for how they mess with the flow of the narrative. Flynn’s argument with the doctor and his departure from the hospital seem to happen at different points in time because the tone and perspective are so different. But even if they happen on the same day, it’s jarring to have them connect the way they do, not split between two pages, or even between two sets of panels, but by one panel dropped at the end of a page, cutting off the dialogue. It’s like telling a joke almost all the way to the punchline, then starting a totally different joke. 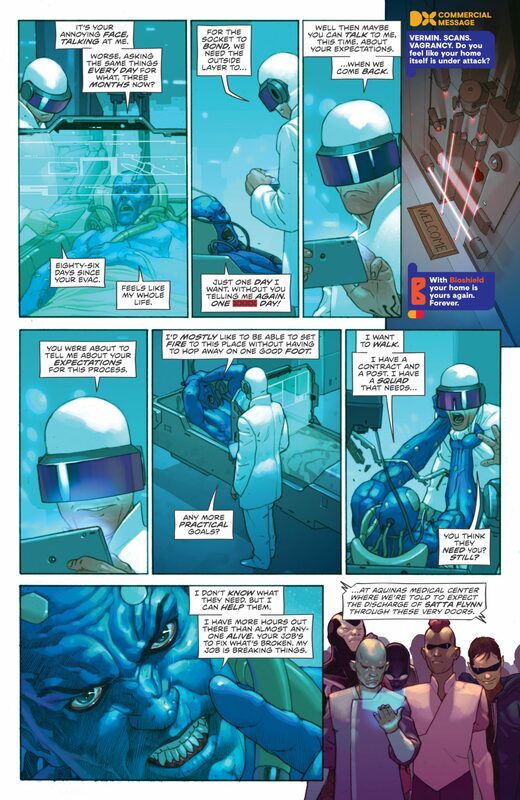 Contrast that with the approach the team takes to Flynn’s ride back from the hospital, which also reveals the ending of the battle that put him there in the first place. Flynn’s crew argue about his surgery and stability until one of Tom Muller’s innovatively designed on-screen warnings pops up, stating we’re “overdue commercial break,” seguing into an exasperated commercial moment as Flynn says a slogan and then cracks open a “Cherry Combat” drink. 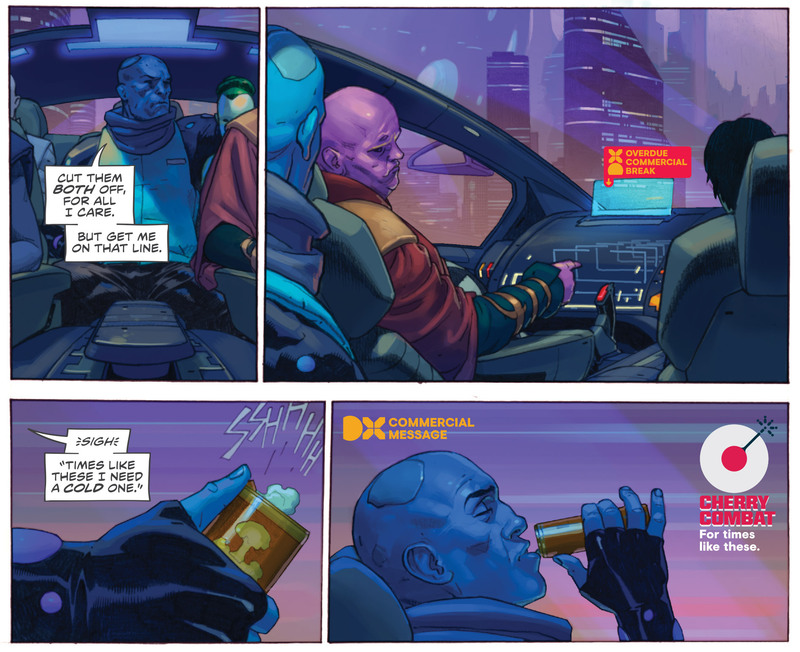 Ribic is then given room for a lush full page moment, showing the team driving off into a ridiculously twisty and industrialized cityscape as Flynn zones out, fading into the realm of his combat memories. These two approaches are the true combat happening within Vs. On one end is the cramped and claustrophobic action sequences that Ribic seems to still be finding his footing with. There, the storytelling itself comes across as rushed and indelicate, as though the creative team are in a hurry to get past the set up in order to unveil the juicier aspects of the story. This would be disappointing in any comic but it’s especially disappointing in a comic featuring Esad Ribic’s art since his style works so beautifully when it’s in service to moments like the car scene, with its mix of leisurely conversation and well-plotted worldbuilding that takes its time and allows the reader to linger on every detail. The quieter, more expansive moments are also where the themes Brandon appears to want to explore concerning the privatization of the military and the commodification of conflict stand the best chance of being profound rather than clumsy. By giving Ribic more of the freedom to convey the characters’ literal place in their environment we can get a better sense of the unique aspects of this universe and also leave room for the dialogue to reveal the intrincancies of this bloodsport economy and the specific motivations the main characters have for participating. Too much chaotic action and Vs is doomed to be one of those anti-violent works that overindulges and ends up glorifying that which it condemns. Of course, first issues of ambitious series often deal with this issue. There’s a lot of information to give to new readers when it’s a brand new world, and it’s necessary to keep things entertaining enough that they don’t tune out before the team can even get to the more complex aspects of the story. 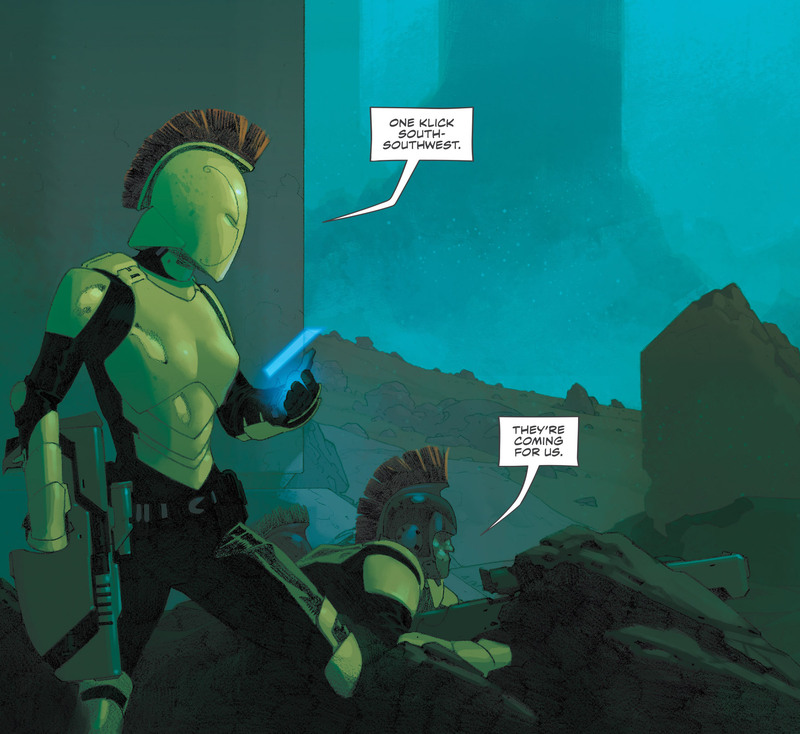 Brandon and Ribic’s prior credits make it easier to trust that they’ll be able to at least somewhat deliver on the promise within Vs, let’s just hope it ends up being more Starship Troopers than Destination Moon in its messaging.